Directions from Manila to Subic via NLEX - SCTEx. Pay P45 at Balintawak Toll Plaza and get your toll card. Drive to the Dau Toll Plaza at the end of NLEX (about 71 km from Balintawak Toll Plaza). Pay P173 at toll booth. Take SCTEx ramp (at the right) about 3 km from the Dau Toll Plaza. Take your toll card at the SCTEx toll booth. Drive to the TIPO exit at the end of the SCTEx (about 57 km). Pay P 168 at the toll booth. Drive to the Subic-Tipo Highway toll booth (about 0.80km). Pay P 22 at the toll booth. Drive by and stop at the Subic Bay Freeport customs booth to acknowledge guard. NLEX and SCTEx imposes a speed limit of 100km/hour. Observe speed limit as radars are installed to check overspeeding. Subic Bay Freeport imposes strict US style traffic rules. That said, slow down to a complete stop at every intersection. And don't forget to wear your seatbelts. Hi Ceeanne! Sorry for late reply. Camana Sanctuary seems to have the best view and facilities. Re car seat, they are not that strict so car seat not necessary. how to go to subic via san fernando exit? 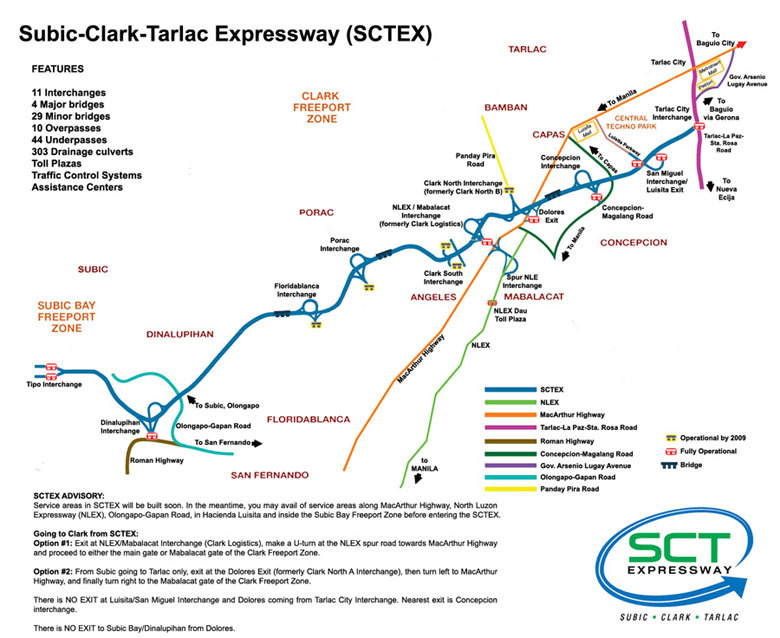 where is more convenient and faster, via san fernando or via sctex? thanks! looking forward driving to subic this coming holidays! Hi Mel! Kindly follow directions stated above:-) Thanks! Hi! Thank you so much for posting this info. My hubby and I are planning to take our kids to Ocean Park Adventure in Subic this Saturday, we’re planning to take the SCTEX from Taft, Manila. The park opens at 10AM, so we’re planning to get a headstart and leave at 6-7AM. Would you know where we could stop and have breakfast? Is there a gas stop with Starbucks and other restos on the way? Would appreciate very much if you could reply. Petron after Meycauyan has Jollibee, Chowking, Pancake house, Teriyaki Boy, and Starbucks. Shell Gas Station after Bocaue has Jollibee (with a Drive-thru), Chowking, KFC, Hen Lin, Starbucks, Pizza hut, Cinnabon, Burgur King and Dairy Queen.